For some reason a blog post I wrote in 2008 pops up when you google "Trendy Knitting Patterns." At the time, I was exploring the most popular patterns according to Ravelry. Here we are, three years later... I guess this means it's time to make an update! Ravelry has over 1.5 million members now! The information you read here is based on the statistics of their members. Obviously there are more knitters in the world than those who have joined Ravelry and uploaded projects but I find this to be interesting anyway. See what you think. First we will examine what is called "popular." Ravelry uses some kind of magic to determine popularity. I think it's a blend of number of projects, number of hearts (when another user "favorites" a project), and number of queues (others who want to knit it). If anyone knows the formula, please let me know! Here is where I would put all of the questions about the magic formulas that determine popularity of people, places and things of the world throughout time and space. Just push that schoolyard junk out of your mind for now if you can. This is about knitting, people. Knitting is safe and we are all included in it. It's ours! Observations: three years ago it was socks, fingerless gloves, scarf, scarf/shawl, socks. Now it's shawl, shawl, shawl, hat, hat. Back then socks were more popular. 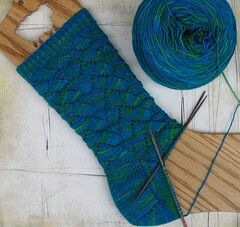 Now, there isn't one sock pattern in the top 40 most popular patterns. Fascinating! It's safe to say shawls are the thing now. 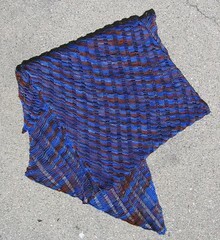 Looking at the top 10 most popular patterns, 7 of them are shawls. Also, let's look at price. Back then, all of the top five patterns were free. Now, three of them are. This is too small a sample to make a conclusion but it's interesting to me anyway. Okay, let's now look at the patterns with the most projects. There is some overlap, but not as much as you'd think. Observations: Even though patterns like Clapotis, Fetching, and Monkey aren't considered to be as popular as they once were, they have stood the test of time. They have been knit by many and will endure, I'm sure. Monkey is 53rd on the most popular list and Fetching is 145th! What was the formula for popular again? The numbers are way lower. What does it all mean? Dunno. But it's neat to see. Finally, the Baby Surprise Jacket needs a special mention. It was first published in 1968, making it the oldest pattern on the list by a good many years. It's 10th most popular and has the 3rd most projects. Everyone has an opinion on it and making one is a rite of passage. One could write a great deal about this pattern but I'll leave it for now. I just wanted to shine a tiny light in it's direction. All of the patterns and designers mentioned here are awesome. It's likely you've knit or thought about knitting something on here. I've made the Fetching, Monkey and Clapotis. How about you? My favorite? The Baby Surprise. So clever! Like origami. And such a lovely connection to EZ. Thanks for posting this; I think it's fascinating! I've knit Turn a Square, Monkey, Jaywalker, and CalErimetry (a cabled version of the Calorimetry pattern). I still need to do a Baby Surprise! You are pretty much the coolest ever, this post proves it. I have made half a dozen BSJs and an Ishbel, those project numbers are staggering. And humbling. You're great with the numbers, but I can't tell you how many times I've knit the baby surprise jacket.